Имате въпрос към Gaonjae Hanok Guesthouse? Разположен в Jongro, Gaonjae Hanok Guesthouse е перфектно място да почувствате духа на Сеул и околностите. Този 1.5-звезден хотел е леснодостъпен, тъй като е само на от летището. С удобното си местоположение хотелът предлага лесен достъп до всички градски забележителности, които задължително трябва да се видят. В Gaonjae Hanok Guesthouse отличното обслужване и достъпните съоръжения допринасят за Вашия незабравим престой. Този хотел предлага множество удобства, за да задоволи и най-изискания вкус. 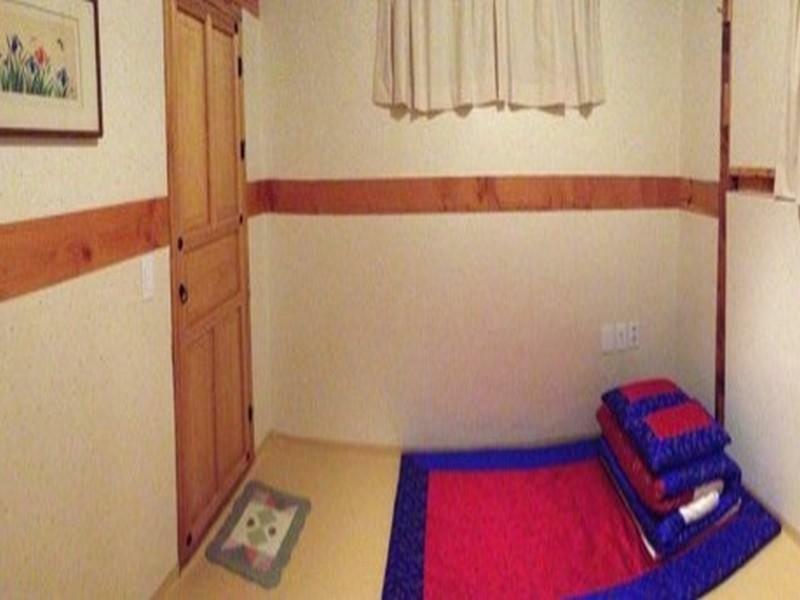 Gaonjae Hanok Guesthouse разполага с 6 стаи, които са обзаведени с вкус. Много от тях предлагат удобства като достъп до интернет (безжичен), стаи за непушачи, климатик, отопление, бюро. Независимо от това, дали сте фен на фитнеса или просто търсите начин да отпочинете след уморителен работен ден, в хотела ще намерите най-висококачествените съоръжения, такива като градина. Каквато и да е причината за Вашето посещение в Сеул, Gaonjae Hanok Guesthouse е идеалното място за една вълнуваща почивка далеч от всичко. 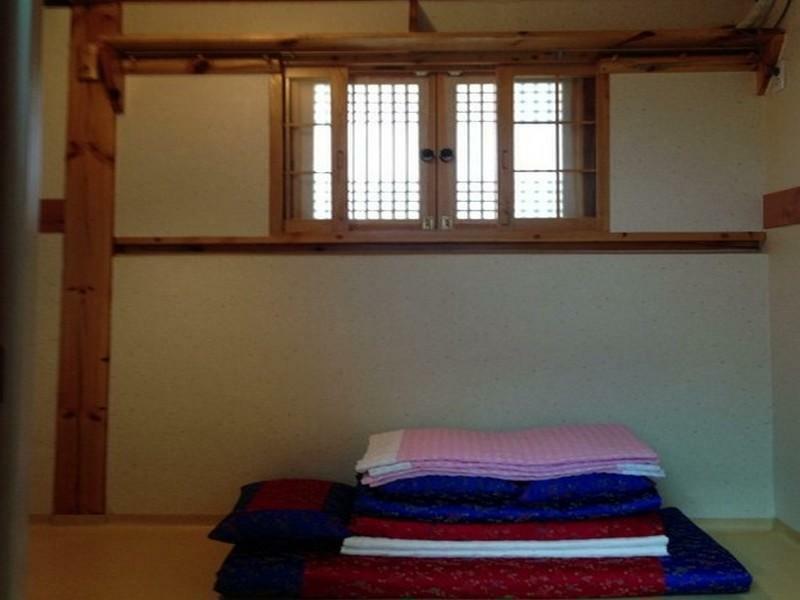 This is a great place if you would like to experience living in a hanok in Korea. We went there during winter, and i must say, the location was really hard to get there. It is located near Bukchon Tourist area. The subway station is about 15 min walk. And when it is in the night, that area is quite deserted. We took cab to the guesthouse. but even the taxi driver couldnt find where is the location. There is a few steep slope near the guesthouse. and its really painful to drag the lugguage all the way up there. When we reach there, the owner of the house was out. Luckily there is a passerby, who helped us called the owner and we manage to get in. We were asked to choose any rooms when we get there. so for the first night we stayed in the mega big room for 6 people instead for 2. After a few hours, the owner then only came back. The room was warm, with warmer on the floor. and the owner prepared breakfast for us every morning. On the last stay of our stay, he even offered to bring out lugguage down the slope and help us get a taxi. I took my one-year-old twins with some family and friends all 6 of us staying at this guesthouse for 3 nights. It was very clean and the owner was kind enough to switch us to a bigger room with shower/toilet. The breakfast was very healthy and all home-made with fresh fruits. The owner was very helpful with our luggage and the gigantic baby stroller. We had a wonderful time there. The only disadvantages would the steep slopes and that it was difficult find. But I guess that`s what makes Bukchong/North village so special. We thought we would love the experience of staying in a hanok, and we did – but for us, it didn’t work out to stay more than two nights. There was simply too little privacy. (The owner is a wonderful guy, but in the end we couldn’t stand having him right behind us looking, whenever we would sit in the beautiful courtyard with a book or computer. We also thought we disturbed the family, when we went to bed later then them.) Also, we just realized we are too unfit sleeping on the floor, and having to walk steep uphill to get home; also we needed more privacy – so in the end we changed to a hotel. 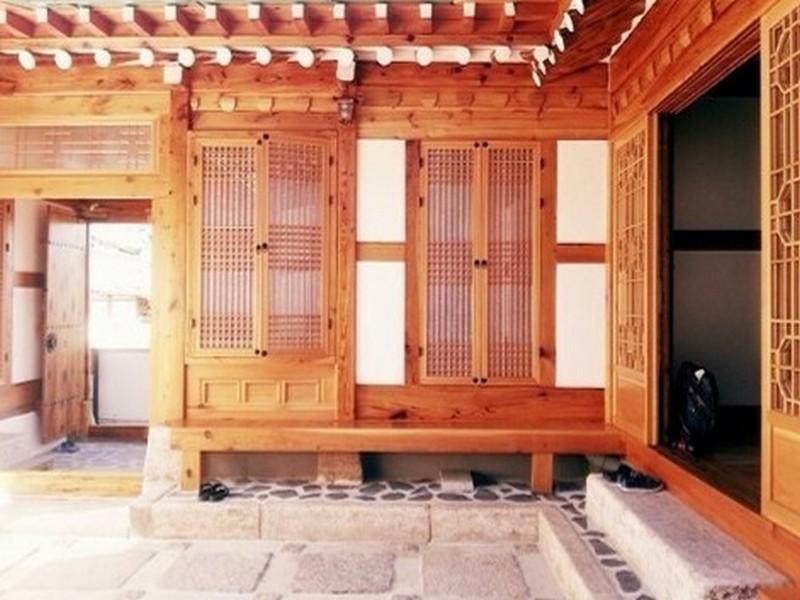 Staying in a hanok really is a fabulous experience, and for many visitors to Seoul it is the most perfect thing you can opt for. But visitors should realize this is much more like ”a family-stay” or ”a home-stay” then living in a guest-house or a simple hotel – you really must enjoy and have time for the interaction with your hosts (and with other guests) in order for it all to work! If you want to stay in a hanok, this is a good option – even though we would have preferred staying in a larger hanok setting with more privacy. Host was very welcoming but with very limited English. Place was very hard to find. Tea and coffee freely available with fresh fruit and toast for breakfast. Stayed for several days and mixed with an interesting variety of people from different countries. We had to change rooms after the first day, there was some pressure on rooms which were traditional Korean style (hanok = sleep on the floor which had underfloor heating). Meals taken together in communal area. Host served us with breakfast at 6am and drove us to a nearby metro station to make sure that we were on a direct line to the airport which was very kind. No refund for leaving a day early (for family reasons). The room was spotlessly clean, the proprietor was extremely friendly, and the location was great, being in the historic Bukchon village, close to Insadong, sightseeing and metro. We stayed here for three nights in April, myself and my 13 year old son. This was a really interesting place to stay, being a traditional Korean House, built in the old style around a little courtyard, with sliding wooden paper lined doors and shutters Our room for two of us was very small, I would estimate about 6ft by 8ft, so not a great deal of space. We slept on the floor, on traditional mat bedding, which I was a bit apprehensive about, but infact it was much more comfortable than I had thought it would be, probably helped by the very warm heated floor. The room had a small attached bathroom and both were spotlessly clean. The proprietor spoke no English at all but we manage fine, finding a way to communicate despite the lack of language and he was very friendly and welcoming. Breakfast was taken in the family room, sitting on the floor around a low table with other guests. We were offered eggs, bread and jam (no butter) coffee and tea and juice and fruit including delicious strawberries. There was a toaster and a kettle on the table so you could help yourself. The location was great, and I am really pleased that we stayed here rather than in a more anonymous western style hotel. The host was extremely friendly and hospitable, though, he did not speak any english. Fortunately I was traveling with a Korean friend, which made communicating very easy. The host even drank beers and taught me how to play traditional Korean card games! 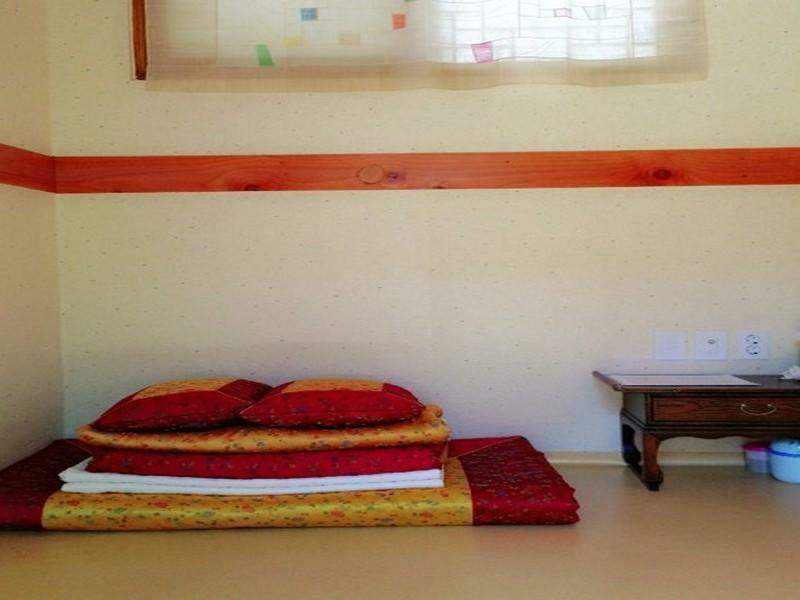 The rooms are fairly small, but very clean and standard as far as a traditional guesthouses go. This one has been newly renovated, so while it has the old world charm and appearance, it feels very fresh and clean. The Wifi is very fast. I believe that I could have stayed here even without have a korean translator, as the host was very friendly and patient. Highly recommend!